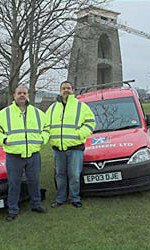 Cleansheen was founded in 2007 by twin brothers John and Mark Harrison. Professional window washing was a second career choice for the brothers, who enjoy working outdoors and the satisfaction of a job well done. This shows in the quality of their work and much of their custom comes from repeat business and word-of-mouth recommendation. Mark Harrison of CleanSheen responded very rapidly to my quotation request, and came the next morning to my Clifton house for external cleaning of windows on three floors. The work was done efficiently with minimum disturbance. As a reputable limited company and member of the British Window Cleaning Academy, Cleansheen meets and exceeds the high standards required of a professional window cleaning business. As a small family affair, it provides a friendly, personal touch. Feedback from customers highlights what sets Cleansheen apart. "You’re the best window cleaners we have ever had!"